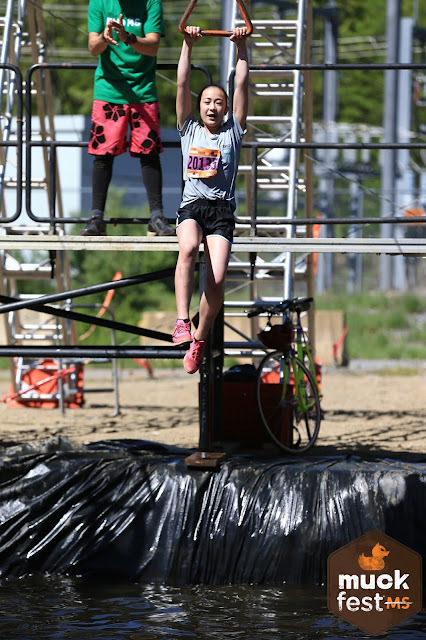 Last year, Dova participated in her first ever charity race at MuckFest MS Boston. She was in a small team of three called the Gymnastys, with a fellow gymnast (obviously) and her dad. This year their team has doubled in size because it's more fun to muck it up in large numbers. You can donate to Dova's page here. Here are some highlights from last year. Before the race, the Gymnastys looked clean and dry, standing on the outskirts of the muddy start line. 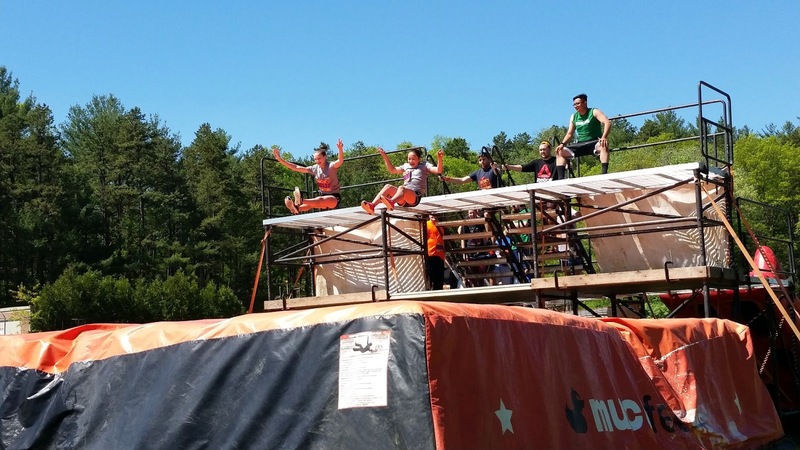 Immediately after the start of the race, they had to run directly into wet, muddy valleys. Here they are contemplating one of the plunges. Next, they battled the Big Balls. They went in so fast you can't even find them in this photo. After that, they headed off into the woods and many obstacles that we only heard about. The Muckfest photographers captured the first cover photo and this sequence of Dova's teammate. Oh yeah, they got wet all right. When they emerged from the woods about an hour later, they tackled the rope climbing obstacles with ease. Their last big jump was onto the Crash Landing pad. 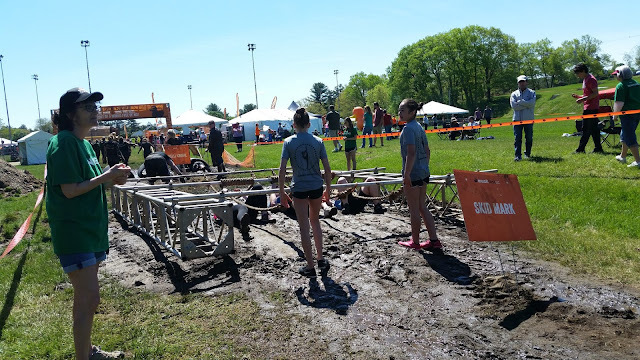 Clearly, they were not dirty enough, so the last obstacles were designed to get both sides muddy. First, the Skid Mark. And then the Belly Crawl. Picture perfect at the finish line. The coldest part was the hosing off afterward. There were plenty of festivities around the event, and they had a game of toilet seat horseshoes in their new "Muck U" t-shirts afterward. Looking forward to it again this year! Please donate!